There is some new visible progress on the planning work for the extension of SkyTrain’s Expo Line along Fraser Highway from King George Station to Langley Centre. 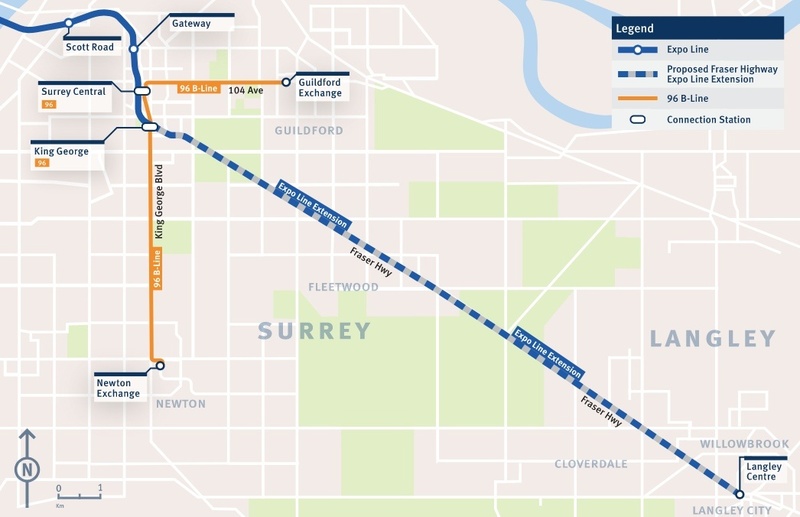 A new project website for the Surrey Langley SkyTrain was launched by TransLink a few days ago, replacing the website for the cancelled Surrey Newton-Guildford (SNG) LRT. 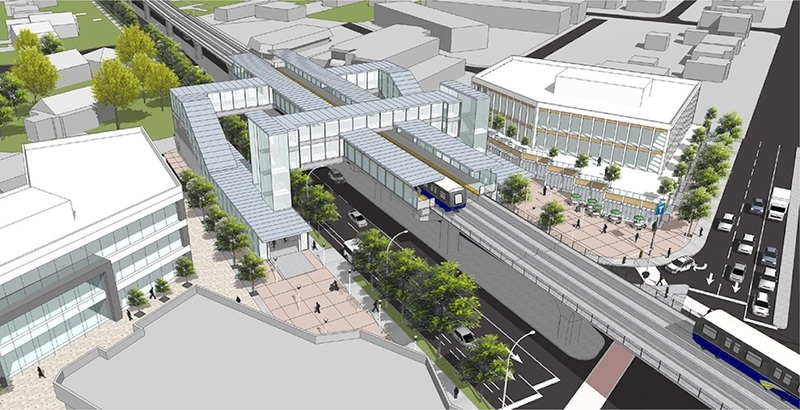 While the website currently does not share any new project details since the Mayors’ Council approved a change in direction to SkyTrain in mid-November 2018, it has released a handful of artistic renderings of potential station design concepts. It is important to note that these designs are highly preliminary, but they provide a glimpse of the possible station designs being considered. One rendering shows the concept of the station at 152nd Street located in the roadway’s centre median, with side platforms and station entrances on either side of the street connected to the platform by pedestrian overpasses. An overhead walkway above the station — seemingly accessible by staircases and an elevator on either end of the walkway — provides passengers with a connection to the opposite platform. This concept carries some similarities to Brentwood Town Centre Station, except that it does not have a mezzanine level as the station’s height is far lower, which is possibly a measure to lower costs and reduce the visual impact to the street. Other renderings released at this early stage of planning depict the station at Willowbrook Drive, serving Willowbrook Shopping Centre. The potential alignment for this portion of the route through Langley City is on the north side of the street, and the station has side platforms as well, similar to a number of the region’s other elevated SkyTrain stations. Up and down escalators, plus a staircase, are provided to each platform for this station concept at Willowbrook. A 15-month project development timeline will lead to the milestone of creating a business plan in spring 2020. After this, a bidding process would take another 15 months, and construction would take about four years. TransLink anticipates it can build a significant portion of the 16-km-long, eight-station Fraser Highway extension as early as 2025 within the reallocated $1.6 billion in funding previously allocated for SNG LRT. Currently, it is anticipated the full extension will cost $2.9 billion, including a $730-million (25%) contingency for any unexpected costs. Additional funding still needs to be secured for the remaining amount. Travel times on the extension are estimated to be about 22 minutes. Roughly 90% of the route is within Surrey’s municipal boundaries. Over the coming weeks, detailed designs are anticipated to be released for the $2.8-billion Millennium Line Broadway Extension between VCC-Clark Station and Arbutus Street, which will enter the bidding phase. Construction on the subway is anticipated to begin in 2020 to allow for an opening in 2025.